Katzentisch: New Rocking Horse Prints! If you like rocking horses you may like my two new prints, too. 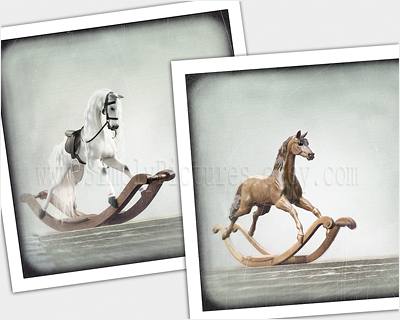 I took my photos of the Dappled Grey and the small mahogany rocking horse and gave them a vintage feel with some discolouration, blur and scratches. You'll find them in my Etsy shop www.SimplyPictures.etsy.com. The price for one print is $ 23.00 plus shipping or $ 41.00 plus shipping for both prints. That's how they would look being framed with a bit of outer trimming but without matting in standard frames size 23 x 23 cm = 9” x 9” from IKEA. The frames are not included! The size is scaled properly - look at the wine bottles!